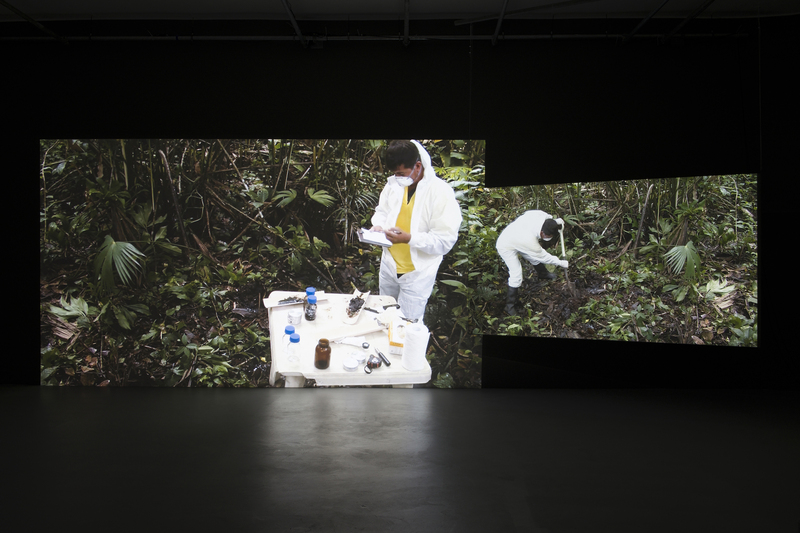 Ursula Biemann and Paulo Tavares, Forest Law, 2014, Multi-channel video installation and photo-text assemblage. The Institute of the Arts and Sciences and the Center for Creative Ecologies presents: The Cosmopolitics of Forest Law Revisited: A Conversation with Marisol de la Cadena and T.J. Demos. This talk is FREE and open to the public. Parking ($5) is available in the Performing Arts Lot. Pay at onsite kiosk. In conjunction with the exhibition Forest Law by Ursula Biemann and Paulo Tavares at the Mary Porter Sesnon Art Gallery, anthropologist Marisol de la Cadena and art historian T.J. Demos will have a dialogue about the rights of nature and Indigenous rights in the Ecuadorian Amazon. Marisol de la Cadena was trained as an anthropologist in Peru, England, France and the United States. Her interests are located at the interface between Science and Technology Studies (STS) and non-STS, and they include the study politics, multispecies (or multi-entities) relations, indigeneity, history and the a-historical, world anthropologies and the anthropologies of worlds. In all these areas, her concern is the relationship between concepts and methods, and interfaces as analytical sites. More prosaically, de la Cadena is interested in ethnographic concepts – those that blur the distinction between what we call theory and the empirical — that can also indicate the limits of both and thus open them up to what exceeds them. Her recent book, Earth Beings. Ecologies of Practice Across Andean Worlds (2015), is based on conversations with two Quechua speaking men that lived in Cuzco (Peru). These conversations are a "thinking-together" about life at the intriguing crossroads where modern politics (and history) and earth-beings (and the ahistorical) meet and diverge, thus exceeding each other. The book is an ethnography concerned with the concreteness of incommensurability and the eventfulness of the ahistorical. Currently de la Cadena's field sites are cattle ranches and veterinary schools in Colombia. There she engages practices and relations between people, cows, and "things" in general. Thinking at divergent bio/geo interfaces, de la Cadena is interested in capturing “the stuff” that makes life and death in conditions of dramatic ecological and political change as the country endures extreme droughts and floods and wants to transition between the violence of war to a condition of peace that might not be without violence. T.J. Demos is Professor in the Department of the History of Art and Visual Culture, University of California, Santa Cruz, and Founder and Director of its Center for Creative Ecologies. He writes widely on the intersection of contemporary art, global politics, and ecology and is the author of numerous books, including Decolonizing Nature: Contemporary Art and Political Ecology (Sternberg Press, 2016), Against the Anthropocene: Visual Culture and Environment Today, (Sternberg Press, 2017), and The Migrant Image: The Art and Politics of Documentary During Global Crisis (Duke University Press, 2013)—winner of the College Art Association’s 2014 Frank Jewett Mather Award. Opening: October 3, 5-7 p.m.
Extended remarks by art historian and theorist TJ Demos at 6 p.m.
Forest Law, 2014, is a 38-minute video essay and book drawn from research carried out by Biemann and Tavares in the Ecuadorian Amazon. It considers the legal cases which plead for the rights of nature against the dramatic expansion of large-scale extraction activities in the region, including the trial won by the indigenous people of Sarayuku based on their cosmology of the living forest. The project creatively maps the historical, political, and ecological dimensions of these trials on behalf of the forest and the people who cultivate the forest, tracing the entanglements and frictions between the ethical and epistemic stakes these cases raise.